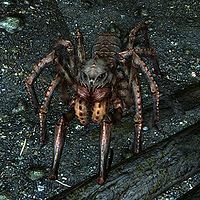 Lis is a friendly frostbite spider and a member of the Dark Brotherhood. It lives in a pool near the alchemy lab in the Dark Brotherhood Sanctuary, where Babette usually is. Attacking it counts as assaulting a guild member, and will cause the entire sanctuary to attack you. Lis dies when the Dark Brotherhood Sanctuary is torched by the Penitus Oculatus during Death Incarnate. You do not have to kill Lis to complete the quest Destroy the Dark Brotherhood!. During the quest Lis is often out of its pool and may attack you with other members of the sanctuary. Lis is the only non-hostile frostbite spider ever found in the game. Lis reappears in Legends as the card Sanctuary Pet. This page was last modified on 13 March 2019, at 08:26.